Michael Traficante is a shareholder of the firm and has practiced law in Southwest Florida since 2006. He has an AV rating from Martindale-Hubbell. Michael’s practice is concentrated in complex commercial and civil litigation involving real property, business, construction, wills/trusts, and commercial issues. 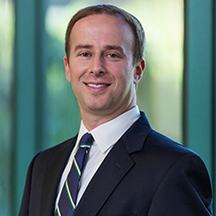 He was named a Rising Star in the 2010 edition of Florida Super Lawyers, and was recognized in the 2018 and 2019 editions of The Best Lawyers in America© in the area of Litigation-Real Estate.